New enhancements also provide ESPs with unparalleled insights into blocklist, spam trap, and complaint issues. NEW YORK, April 2, 2019 — The Return Path Partner Platform is the first and only deliverability platform designed to empower email service providers (ESPs) to proactively monitor and diagnose deliverability issues across their full client ecosystem. Building on the success of the platform’s 2018 launch and new features announced in December, leading email solutions provider Return Path is pleased to announce even more enhancements to this groundbreaking solution. For an ESP, managing email deliverability for hundreds—or even thousands—of diverse clients can be a challenge. Return Path’s Partner Platform allows ESPs to manage deliverability issues across their entire customer base by integrating all the relevant monitoring and diagnostic information in one convenient location. With this release, the Partner Platform now includes new and enhanced data sources, as well as new features to provide even more valuable metrics and insights. The centerpiece of this release is a new real-time API, which gives ESPs unparalleled visibility and data related to Cloudmark message filtering. Cloudmark, a division of Proofpoint, is a trusted leader in messaging security, with a footprint that covers hundreds of millions of mailboxes and customers that include hundreds of email service providers around the world. 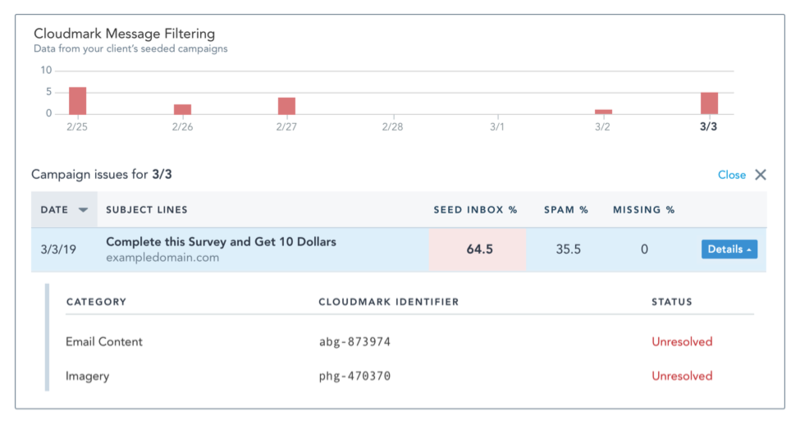 By combining Return Path’s comprehensive deliverability data with Cloudmark filtering data, ESPs can understand which clients and which specific campaigns are being filtered by Cloudmark. This addition makes the Partner Platform a true one-stop shop for identifying user complaint issues, pinpointing specific problems, and understanding how to solve them. Surface user complaint issues from Cloudmark that impact clients’ campaigns from a convenient dashboard, with the ability to drill into problematic campaigns for more insights. The Partner Platform is now available to ESPs. To learn more about becoming a Return Path partner or the Partner Platform, call 866.362.4577 or complete this form. Return Path analyzes the world’s largest collection of email data to show businesses how to stay connected to their audiences and strengthen their customer engagement. We help mailbox providers around the world deliver great user experiences and build trust in email by ensuring that wanted messages reach the inbox while spam doesn’t. To find out more about Return Path solutions, visit us at returnpath.com or request a demo.